Nowadays with a huge number of fantastic and cool videos and amazing entertainment programs, YouTube has to attain the highest ranking among the world’s best platform to give entertainment to its viewer. Today’s topic is “How To Download YouTube Videos On iPhone” is specifically for our those iPhone users who want to enjoy YouTube videos when they are offline or no internet connection is available. We will provide the best ever methods to download YouTube videos and enjoy them when you are not online. Here we will discuss How to save YouTube Videos On iPhone Camera Roll. These methods will be beneficial for all iPhone models like iPhone X,iPhone 8, iPhone Xs etc. Now we are going to start How to Download YouTube Videos On iPhone 2019 methods demonstrations. Because of strict policy to download videos on You Tube and some critical restrictions of Apple Products it can’t be easy for users to download videos from You Tube. It can be difficult and videos can’t be easily downloaded from You Tube only by a single click to download . 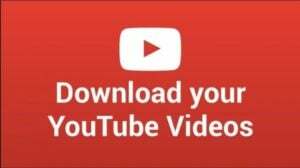 For this purpose we are here to tell you most convenient ways to download videos from You Tube easily on your iPhone . We will also introduce some third party applications to download these videos. Titan Downloader is a type of Third-Party application that helps you to download YouTube videos on your iPhone. Now we will understand its working. First Open Safari,go to YouTube website search for your video, open it. And then simply copy the link of the video you want to download. You can also let the video play in the YouTube app and then click on the share icon, and copy the link, just like we did before. In Titan Downloader, paste the link and let the video come up. Now very quickly, click the play button and tap Done. Tap and hold on the Video window, a pop-up menu will come up. Now you can Download easily the video. However This method is not much workable, as Titan Downloader is old, and it might not be available now or in the near future. Make sure to try this if you can. Third Party Applications like this usually get blocked and are unavailable. This can be a difficult situation to users. Download Documents from the App Store . On the lower right side, a Safari-likeicon will be present. Tap the icon. A web browser will be open. Type https://www.vidpaw.comand open the website. You can open Safari, go to YouTube website, search for your video, open it. And then simply copy the link of the video you want to download. This copied link will help you to download videos. Also you can play video in the YouTube app and then click on the share icon, and copy the link to your iPhone. Now go back to Documents browser where you have Vidpaw website open. Paste the Video URL and click on Start. Tap Doneand the app will download the video. Select Moveand select Camera Roll. Now you’ll find this video in your Camera Roll. With the help of these simple ways, you can download YouTube videos to your Camera Roll in iPhone and watch them whenever you want. Instead of using Vidpaw, you can also use en.savefrom.net on Documents browser and follow the same steps. Shortcut is another Beneficial newer app that you can use to Save YouTube Videos to iPhone. It is as convenient as Documents to download. Let’s start downloading YouTube videos with a ‘Shortcut’ app. You will need to add the Download YouTube Shortcut.Get it here, then tap this link, click on Get Shortcut to add it to the app. You will see the Download YoutubeThen Click Done. There is a small catch to downloading YouTube videoswith Shortcuts- your video needs to be playing, in the app or Click on the Share icon from whichever platform you are watching. Go to Get Contents of URL, your video will be downloaded and you can choose to share it or save to your Photo Album. With the help of this simple ways, Shortcuts app can help you Download YouTube Videos to your iPhone. YouTube has a feature for downloading, though you can only use it in the free version to download in the YouTube app itself. Some countries have this feature available in YouTube Premium, which you need to buy to enable downloading videos from YouTube the legitimate way. So, you can check that out and use it, if it appeals to you. The advantage is that there’s no long steps or hassles or third party applications getting blocked. So if you’re not one for long procedures and headaches, you can download videos on the YouTube App itself by the help of this. This You Tube++ is a hack version of the YouTube app, containing more efficient features like Background Playing, and yes, Downloading Videos to your iPhone directly. The only drawback with this app is the security risk as it does not exactly follow the App Store regulations (obviously). However, if you really are keen on downloading YouTube videos without too much hectic work, this app can be used. Extract the .zip file or drag the application from .dmg to Applications folder. Once it is downloaded, connect your iPhone or other device to your PC. Make sure to delete the YouTube app, the legitimate one, from your device, and close all applications. Now Runthe Cydia Impactor on your PC. For windows, do not run the application as If you face problems on opening the App because of your Gatekeeper settings, check for tutorials about how to open third party apps from unidentified developers in OSX. Check if your device is detected by Cydia Impactor.Make sure it is the right device. Now, simply drag your IPA filein the Cydia Impactor application window. First Enter your Apple ID and password when prompted. The device will get permission to install the IPA file on your device as an application. Then the sideloading process will initiate and might take a few minutes. Once it is, you’ll be shown Complete. Open your device and try to find the YouTube++ icon, and most likely you shall find it. The application has been installed. Now, disconnect your device. For the last step, Open Settings, go to General > Device Management. Tap on the relevant Apple ID used when you sideloaded the IPA file. Tap trust and confirm that you want to trust applications installed by that user. This is all about this method Now you can Open the YouTube++ app and easily save videos on your iPhone. We hope this article was much informative and beneficial for you. Hopefully, now you are able to Download Videos from YouTube easily by using these convenient ways mentioned in this article. If you have any questions regarding this article, feel free to ask we will give a satisfactory response regarding your questions. That’ all about today’s article for more interesting articles visit our website.